Ford Consul Brake Pad Replacement at your home or office. Ford Consul Brake Pad Replacement costs $135 on average. What are brake pads and how do they work? Brake pads consist of friction material that is bonded to a sturdy steel backing plate. When you push on the brake pedal, the friction material on the brake pads is forced against the inner and outer surfaces of the steel brake rotor under tremendous pressure. The resulting friction causes the wheels on your car to slow rapidly allowing for a quick, safe and controlled stop. After thousands of miles, this friction material eventually wears away, and the brake rotor wears away as well, requiring replacement. When to replace brake pads? Wear indicator on vehicle dashboard. When the friction material on the brake pads is worn to within 2 mm of the pad backing plate, replacement of the pads is necessary. Most newer cars today have electronics built into the brake pad. When the pad is at a point that it needs to be replaced, a symbol will appear on your vehicle dashboard’s instrument cluster. Consult your owner’s manual to learn what the symbol looks like. High pitched squeal when braking. When the friction material on the pads is worn close to the backing plate, you may hear a squealing or squeaking noise as you drive regardless of whether you are applying the brakes or not. That squealing or squeaking noise is designed to make you aware that the brake pads are getting low and need to be inspected. If all of the friction material on the brake pad has been worn away, you will hear grinding and scraping noises when you apply the brakes. Pad replacement is mandatory at this point and the vehicle is unsafe to drive until corrected. Brake pedal pulsation or vehicle vibration. Over time, brake rotors may develop excessive thickness variation (>.001 inches), excessive runout on the wheel hub (> .002 inches), or the brake rotor may warp due to high operating temperatures. If these defects exist, you may notice pulsation in the brake pedal or steering wheel during braking. New pads and rotor resurfacing or replacement will be required if the rotor has any of the above-mentioned deficiencies. Vehicle pulling or wandering on braking. If your car pulls to the right or left during braking, that could be a sign of a sticking brake caliper, misalignment of the suspension, and sometimes tire defects or uneven tire inflation from side-to-side. The mechanic who inspects your vehicle will determine if new brake pads alone will resolve the issue or if other repairs are needed. High mileage on existing pads. Regardless of whether any of the above brake system symptoms occur, every 10,000 miles a mechanic should measure the thickness of the remaining friction material on the brake pads and perform a thorough visual inspection of the braking system. Brake system warning lights and/or maintenance reminder messages. Should your brake system warning light ever illuminates, or a brake system related maintenance reminder message appears in the driver information display, have your vehicle inspected and repaired as soon as possible. How do mechanics replace brake pads? Confirm the thickness of the remaining friction material on the brake pads. If the remaining friction material is less than 2 mm in thickness, pad replacement is warranted. Visually inspect the brake rotor surface that contacts the pad (for scoring, pitting, grooves, rust) and measure the brake rotor with precision tools for thickness variation, run-out and warpage. Inspect the caliper, torque plate, pads, and rotors to determine if the caliper is operating freely (i.e., inspect for stuck calipers). Install new pads and any additional recommended components (e.g., rotors, if rotors depart from OEM specifications) only with customer approval of course. Lubricate brake system components, such as caliper sliding pins, and inspect the condition of the brake fluid. Top off brake fluid as required. 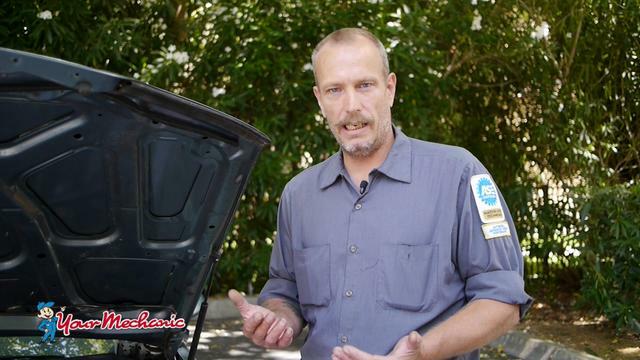 Perform a basic 50 point safety inspection of your vehicle. Finally, the mechanic will test drive your vehicle to confirm normal operation of the brake system. Is it safe to drive with a brake pad problem? Driving a vehicle with a known deficiency in the braking system is unsafe and consequently is not recommended. Worn out brake pads can increase stopping distances and so for your safety, it is always advised that worn out brake pads be replaced promptly. Further driving is not recommended and you should request service at your earliest convenience if any of the following circumstances exist: stopping distances are much greater than what you are accustomed to; the brake pedal is not firm or is low; there is loss of braking power assist; the vehicle pulls severely to one side on braking; or the brake system warning light is on. If you detect unusual noises, such as squealing or grinding, but stopping distances are close to what you are used to, and the brake pedal is firm, and there are no warning lights, it may be safe to proceed to your destination but schedule service at your earliest convenience. When it comes to the brakes on your vehicle, always err on the side of caution and have a mechanic check your brake pads and braking system at the first indication of a problem. Brake pads must always be replaced as a set, that is both wheels (driver and passenger side) on an axle, front or rear, must be serviced. If brake pads on only one side of the car were replaced, your car might pull to one side when you apply the brakes. Often, resurfacing or replacement of the brake rotors is necessary and a competent mechanic will always measure for wear and damage to the brake rotors and advise you as to whether rotor replacement or re-surfacing is needed.